A new collaboration combines data from amateur astronomers with data from NASA mission archives. This quartet of galaxies represents a sample of the images that have been created. The four galaxies are M101, M81, Centaurus A, and M51 starting in the upper left and moving clockwise. X-rays from Chandra are purple, infrared data from Spitzer are red, and the optical data are red, green, and blue. Long before the term "citizen science" was coined, the field of astronomy has benefited from countless men and women who study the sky in their spare time. These amateur astronomers devote hours exploring the cosmos through a variety of telescopes that they acquire, maintain, and improve on their own. Some of these amateur astronomers specialize in capturing what is seen through their telescopes in images and are astrophotographers. The images in this quartet of galaxies represent a sample of composites created with X-ray data from NASA's Chandra X-ray Observatory, infrared data from the Spitzer Space Telescope, and optical data collected by an amateur astronomer. 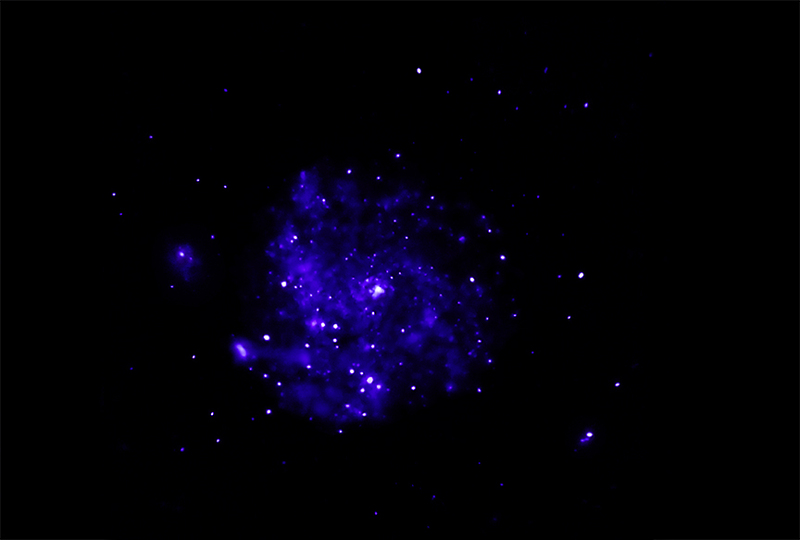 In these images, the X-rays from Chandra are shown in purple, infrared emission from Spitzer is red, and the optical data are in red, green, and blue. The two astrophotographers who donated their images for these four images -- Detlef Hartmann and Rolf Olsen -- used their personal telescopes of 17.5 inches and 10 inches in diameter respectively. More details on how these images were made can be found in this blog post. 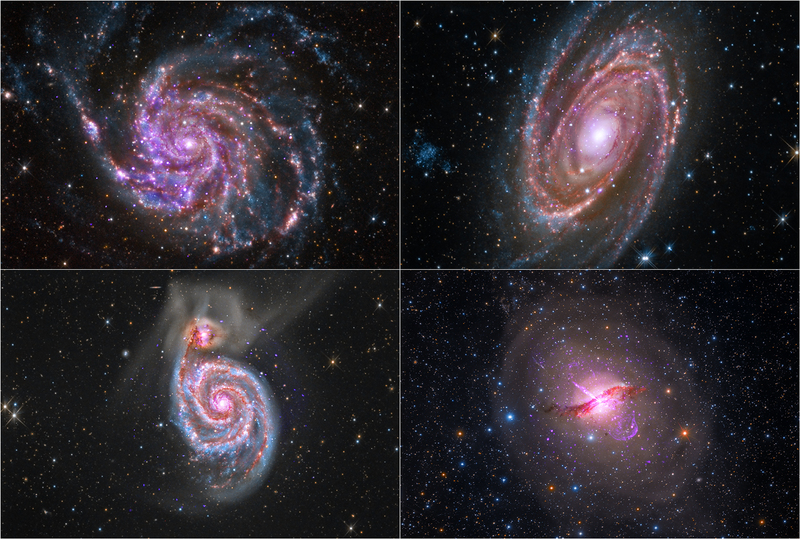 Starting in the upper left and moving clockwise, the galaxies are M101 (the "Pinwheel Galaxy"), M81, Centaurus A, and M51 (the "Whirlpool Galaxy"). M101 is a spiral galaxy like our Milky Way, but about 70% bigger. It is located about 21 million light years from Earth. M81 is a spiral galaxy about 12 million light years away that is both relatively large in the sky and bright, making it a frequent target for both amateur and professional astronomers. 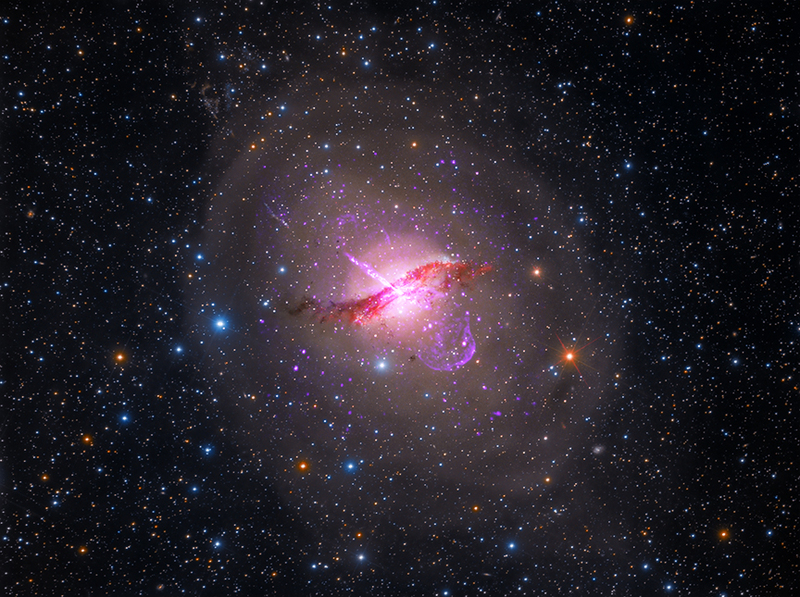 Centaurus A is the fifth brightest galaxy in the sky -- making it an ideal target for amateur astronomers -- and is famous for the dust lane across its middle and a giant jet blasting away from the supermassive black hole at its center. Finally, M51 is another spiral galaxy, about 30 million light years away, that is in the process of merging with a smaller galaxy seen to its upper left. For many amateur astronomers and astrophotographers, a main goal of their efforts is to observe and share the wonders of the Universe. However, the long exposures of these objects may help to reveal phenomena that may otherwise be missed in the relatively short snapshots taken by major telescopes, which are tightly scheduled and often oversubscribed by professional astronomers. Therefore, projects like this Astro Pro-Am collaboration might prove useful not only for producing spectacular images, but also contributing to the knowledge of what is happening in each of these cosmic vistas. Coordinates (J2000) RA 14h 03m 12.59s | Dec +54° 20´ 56.70"
Coordinates (J2000) RA 09h 55m 33.20s | Dec +69° 03´ 55.10"
Coordinates (J2000) RA 13h 25m 27.62s | Dec -43° 01' 08.80"
There seem to be images of some stars that are "paired" with another in a different wavelength. Could it be that they are the same star which is moving relative to us in a linear fashion and is therefore not two celestial bodies but the same star moving at an extremely fast rate of speed? Couldn't their relative distance be deduced accounting for the separation of said wavelength images and extrapolate where the stars are ACTUALLY in real time once calculating the distance from us. Then we could conjecture as to it's realtime position today. The Fermi bubble is quite prominent. In my view this bubble is composed of and motivated by dark energy. We cannot see dark energy, but we can detect the material it is buoying along. The source is the nucleus of the galaxy, composed of multiple black holes. Very nice pics. good in depth view of the objects, good for observation. Nice image depths, layers of color, keeps the imagination working well.